- Gloria J. Katch on 六月 7, 2016. Wine, famous women and the wonder of cinematic storytelling displayed in the vintage and characteristic settings of southern Ontario make the Niagara Integrated Film Festival (NIFF) a momentous and unique event. 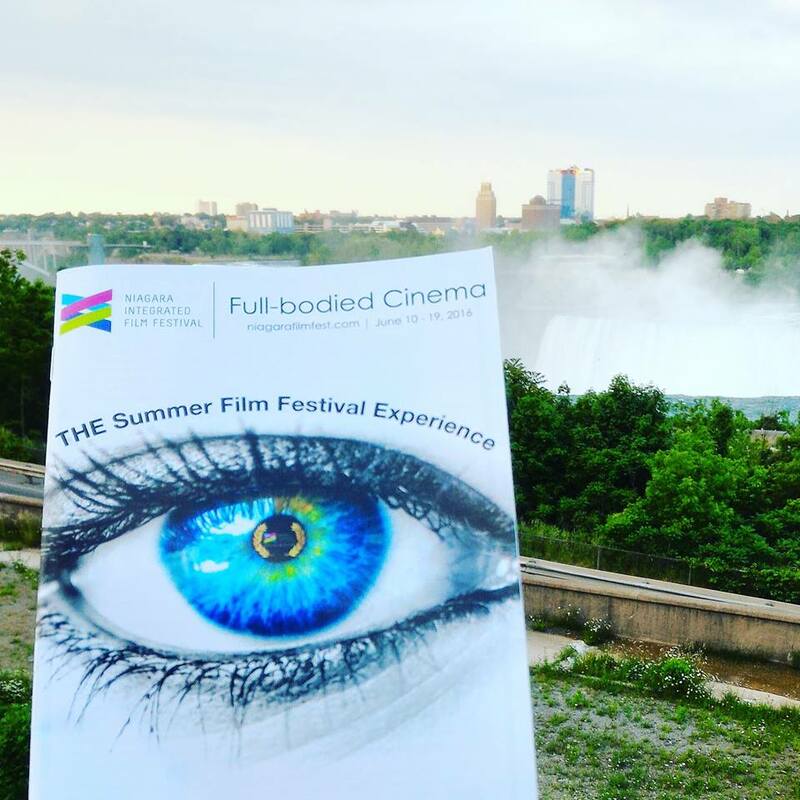 Running for two weekends from June 10 to June 19, 2016 in various locations throughout Niagara, the festival’s accessibility and affordability are a real deal with most showings priced at $15 and $12 for students and seniors. This year is the third annual festival in Niagara, and its Manager, Robert Lalonde is expecting about 10,000 enthusiasts to attend the screenings of 30 movies from many different genres and themes that showcase the best of international, national and local talent. Tickets can be obtained by calling (905) 397-6775, or online at niagarafilmfest.com, but should be purchased in advance. The idea of an integrated festival means the event becomes a part of the culture of the community, explained Lalonde. Like Italy, Niagara’s countryside is resplendent with plush grape vineyards and fruit orchards, so the festival organizers chose Trius Winery in Niagara-on-the-Lake to host a befitting movie, All Roads End in Rome, a Cannes Film Festival favourite. Starring heartthrob leading actors and actresses from all age groups: Sarah Jessica Parker, Raoul Bova and Claudia Cardinale, this love story will be magically set under the stars in the vineyard, sipping a glass of wine with your popcorn. This Filmalicious event also offers a pre-dinner for those who so choose. The festival is flying in Ms. Cardinale and Mr. Bova to attend this Canadian premiere, and they will be available for a Question and Answer session after the showing. Similar in tone, One Wild Moment is a comedy/drama from France that plays out an awkward, inappropriate moment that is sure to put a smile on your face. Lalonde has booked several question and answer meetings with stars, cinematographers and other luminaries after screenings, but it will depend on the schedules of each celebrity, and how much time they can spend with the public, he said. Filmgoers can bring cameras for the Q & A sessions. Like the Toronto International Film Festival, Lalonde said the Niagara counterpart has attempted to attract many stars and people who work in the industry to this event as a part of building its reputation and success. Programmers also chose a variety of different movies, many with a message from across the globe and genres to suit everyone’s palette, including an homage to Italy and Hong Kong’s films, La Stoffa dei Sogni (The Stuff of Dreams), Quo Vado and several Italian short films. The Bodyguard was acclaimed at the Hong Kong Film Festival for its stark realism and pathos. While film festivals focus mainly on adult content, a tribute to Disney Studios Canada for their support resulted in Disney Pixar’s Finding Dory (voiced by Ellen DeGeneres) swimming its way onto the schedule on June 17 at Partridge Hall, First Ontario Performing Arts Centre. Following that event, Genius starring Jude Law and Colin Firth portraying two men instrumental in curating the works of famed writers, such as Ernest Hemingway, Scott Fitzgerald and Thomas Wolfe in the 1920’s. This drama also starring Nicole Kidman, Guy Pearce, Dominic West and Laura Linney, received many awards for living up to its title. Another behind-the-scenes story, but this time the focus is on a husband and wife research team and their contribution to the film industry in Harold and Lillian, A Hollywood Love Story. This endearing famous couple gave their heart and soul to the arts and graced everyone’s guest list in Hollywood. Produced by Danny DeVito, this film will be shown at the Film House, First Ontario Performing Arts Centre (250 St. Paul St., St. Catharines) on June 12th at 12 noon. “This new centre overlooking the Queen Elizabeth Way and Highway 401, was recently designed in St. Catharines for housing dramatic, musical and artistic events. Its beautiful architecture, sense of elegance, and its multiplex rooms are a contributing factor to the expansion of NIFF this year,” said Lalonde. The Seneca Queen’s Theatre on Queen Street in downtown Niagara Falls is 150 years old, and it’s nostalgic setting punctuates the artistry of Canadian and Niagara filmmakers, noted Lalonde. On June 11 and 12th at the Queen Street Theatre in Niagara Falls, a number of Canadian and local filmmakers’ works will be shown: Niagara Rises Shorts, Farhope Tower, Equity, Mammal, Harry Benson: Shoot First, Bound, The People Garden, Okpik’s Dream and The Embargo Project. The short features and documentaries focus on important topics, including human rights, climate change and relationships that are so important in this global world and our ever-expanding planet. These slice-of-life films promise to be both inspiring and enlightening. Please check the time and schedule for these presentations. A great example of the Canadian fare entered this year is Okpik’s Dream, nominated for Best Documentary at the Canadian Screen Awards, which focuses on the life of an amazing 60-year-old Nanuvut musher and amputee, who still manages to live in the desolate cold and survive with his dog-sled team. It’s a story about courage and resilience that will warm your heart. Another educational component of NIFF, also popular with larger festivals are industry conferences held for exchanging information, ideas and networking. This one titled: Striding Forward – Structuring the New Road Map will be held June 17 from 9 a.m. to 6 p.m. at the Old Mill Inn at 271 Merritt St., St. Catharines. This event is a steal at $75 for the entire day with industry leaders, such as Mark Shekter, a credited writer and producer, discussing the survival of the media. Colin Chilvers, Oscar award winner for visual effects; Neil Corbould, who works with Ridley Scott; Terry Fallis, two-time winner of the Stephen Leacock Award and author of five national bestsellers; and Nobu Adilman, who wrote and starred in many television shows including: The Trailer Park Boys and the Food Jammers on the Food Network, are among the special guests. After lunch, representatives from many television and film funding associations will discuss opportunities and investments in the future of film. There will also be a virtual reality demonstration, just to add a touch of fantasy and whimsy to the lecture. The Minister of Culture, Melanie Joly will also attend the conference, and hopefully take back several ideas to the federal government. Festivals, in general, have “a lot of residual benefits that become bigger as the festival grows and becomes more profound,” pointed out Lalonde. “The economic increases to this area could reach $1 million if everything goes as planned,” he said. Last year, about 8,000 people attended the one-weekend event. With two weekends scheduled this year, new locations and more celebrities, Lalonde is optimistic the festival will perform well. We look forward to this year’s NIFF (Niagara Integrated Film Festival).